Making photos on the last available free spot in our home - our bed! Our Reno is moving forward nicely, but living on the building site is proving to be quite a test of nerves! First up my Misae Shawl. It is such a nice pattern to knit and because each sequence goes through 2 or 4 rows it makes for a nice change and makes the incredibly long rows seem quite short! 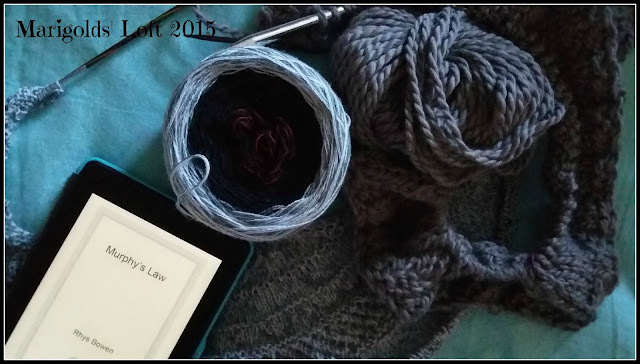 I can't wait to get to the first colour change in the yarn and I am hoping that will happen shortly. I have also cast on a wonderfully bulky project for myself. I am knitting myself Silver Haze from Garnstudio and am knitting it up in Drops Andes, which makes for a nice bulky knit and it grows super quick! As some of you may know I am a knitter that likes to simplify everything and where possible knit everything either in pairs or as one piece. With this cardigan it is no different. I am knitting it all in one piece and hope to show you more next week. Jas's Socks have been a bit neglected over the last week and I do hope to get a little time to spend with them over the next couple of days if possible. Hubby's Gloves were finished in the nick of time and I will share them with you on Friday. So far it is quite a good read and I am enjoying it. Such lovely projects and I love the dusty colours! Good luck with your work and renovations! They are really nice projects and I Ma enjoying them quite a bit. Yes, they are wonderfully cozy, but at the moment we are having very untypical November weather - warm and sunny! Do you have the same where you live? 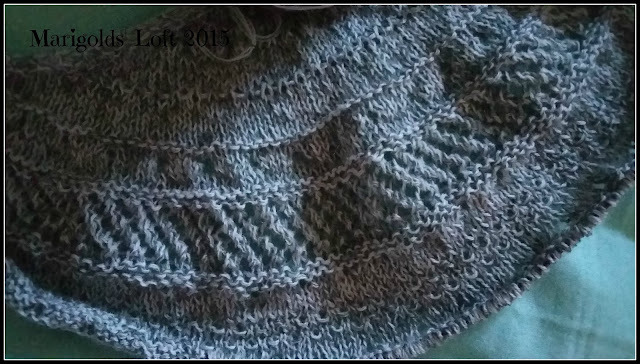 The Misae shawl looks beautiful and quite ethereal in that yarn. I love bulky knits! When I saw the Misae knitted by Andrea from Wollehimmel in her yarn I knew I had to knit it too :) I am really glad I am, and it is a lot of fun! Pretty shawl! 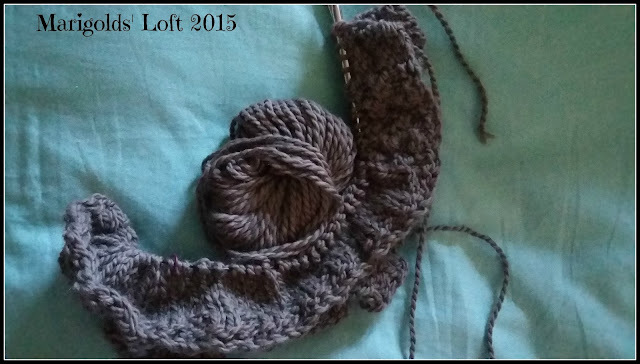 And, it's always nice to have an instant gratification, bulky thing on needles! Enjoy!